*The Key Moment:* Second place Kyle Busch spun Dale Earnhardt, Jr. out of the lead, but it was Clint Bowyer who drove through the carnage to eventually assume the win as the yellow flag flew. *In a Nutshell:* It ain’t over until it’s over -- and sometimes it isn’t over even when it _is_ over. *Dramatic Moment:* When Denny Hamlin’s tire started deflating, it set off a dizzying chain of events over the final twenty laps. *What They’ll Be Talking About Around the Water Cooler This Week* *Kyle Busch had a pretty clever plan* for winning the race. I hope he had an equally clever plan to get out of Richmond alive. But before you toss stones (or beer bottles), ask yourself this question: if Dale Jr. had wrecked the No. 18 car with the exact same move, would you have thought it was dirty pool, or just good hard racing with three laps to go on a short track? The Key Moment: Second place Kyle Busch spun Dale Earnhardt, Jr. out of the lead, but it was Clint Bowyer who drove through the carnage to eventually assume the win as the yellow flag flew. In a Nutshell: It ain’t over until it’s over — and sometimes it isn’t over even when it is over. Dramatic Moment: When Denny Hamlin’s tire started deflating, it set off a dizzying chain of events over the final 20 laps. Kyle Busch had a pretty clever plan for winning the race. I hope he had an equally clever plan to get out of Richmond alive. But before you toss stones (or beer bottles), ask yourself this question: if Dale Jr. had wrecked the No. 18 car with the exact same move, would you have thought it was dirty pool, or just good hard racing with three laps to go on a short track? While they may still be trying to find a way to sneak Busch out of Richmond under the cover of darkness (and I can’t imagine how ugly it would have gotten if Busch had actually won), someone might want to order a suicide watch placed on Junior. He’s sounded beyond despondent these last couple of weeks. Did Denny Hamlin park his car up against the wall to draw the caution in order to give his Toyota teammate Kyle Busch another shot at the win? There’s one thing about a fight between Kyle Busch and Steven Wallace; a lot of fans wish both could lose. Wallace has been trying hard to show some maturity and patience this year, with mixed results at best. Now, it’s Kyle’s turn to try and give this maturity thing a shot; his older brother Kurt has, by and large, reigned in his immature conduct, so a turnaround is possible if Busch would only try. He might want to start by reviewing tapes of how Mark Martin battled the M&Ms Toyota for second in the final two laps before settling for third. Of course, Kyle Busch can also be his own worst enemy. In post-race comments, the 23-year-old tried to paint himself as the victim of the incident he clearly caused. He then castigated one of the No. 88 crew members for daring to come confront him after the race when, in fact, he did the exact same thing after Friday’s Nationwide event. Busch said he’s going to have to “put up” with the rage of Earnhardt Nation after this mess. Well, how about if he just tried a different approach instead: “I screwed up, and I’m sorry it happened. I’ve been screwing up a lot lately because of my eagerness to win; I’m going to learn from this mistake, and move on down the highway.” A heartfelt apology might have gone a long way towards letting Busch visit a burger joint this week without a SWAT team in tow. The three drivers who are arguably the biggest stars in the sport — Earnhardt, Gordon and Stewart — have still failed to win a race this year. If they handed out trophies for almost winning races, Denny Hamlin would need a bigger house. You think these open wheel stars who decided to go NASCAR racing are ready to hitchhike back home yet? Who are the real winners as Jack Roush and Carl Edwards signed a contract extension while Roush and Greg Biffle seem poised to do the same? The remaining potential, high profile free agents like Ryan Newman and Martin Truex, Jr. just saw their price tag ratchet up a few notches. But the true keystone to this year’s Silly Season is where Tony Stewart might or might not end up next year. Oh, and Jamie McMurray might want to start brushing up his resume if Roush is going to be limited to four teams next year. In an apparent about face, NASCAR decided this week to appoint a committee to study potential changes to their drug testing policy. Anytime I hear the word “committee,” I think of two things; the Pontiac Aztek designed by committee rather than visionaries, and the old quote about the beach being littered with the bleached bones of those with good intentions who never moved forward. Will the last mechanic who hasn’t worked as crew chief for Robby Gordon please turn out the lights at RGR when he leaves? Maybe another post-race dyno test is in order? These Toyotas look all but unbeatable lately. Denny Hamlin flat out dominated the race, leading 381 of the first 382 laps with ease until a soft tire ended his chance for a win. It looked like Dale Earnhardt, Jr. was finally going to snap that two year winless streak — now at 72 races — until Busch came to shove. Once again, the No. 17 car couldn’t seem to get out of its own way; and as a result, Matt Kenseth was caught up in the big wreck. Jimmie Johnson’s off song season hit another sour note with a 30th place finish on Saturday. Kurt Busch just doesn’t seem to be able to finish a race lately after a strong start to the season. Maybe Jamie McMurray can lend him a bottle of Crown Royal? He had to be there to be in position to win, but that trophy practically fell into Clint Bowyer’s lap. Michael Waltrip is lucky half the world is mad at Kyle Busch and they’ve already forgotten his thuggish behavior in parking the No. 5 car. As bad as Jeff Gordon’s car unloaded off the truck and looked in the first half of the race, coming away with a top 10 finish Saturday night had to feel like a win. Despite significant damage in the incident that triggered the big wreck, Carl Edwards soldiered on to a top 10 run. 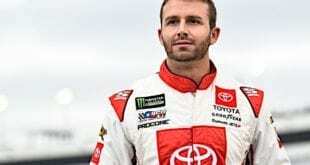 Joe Gibbs Racing grabbed the headlines all weekend, but it was Richard Childress with the race win and all three drivers finishing in the top 12 when they wrote the paychecks out on Saturday night. Reed Sorenson survived a wreck and several close calls to claim a 12th place finish, his best since a top 5 in the season-opening Daytona 500. This win was Clint Bowyer’s seventh consecutive top 10 finish. Kyle Busch (second) is averaging a fourth place finish in the last four races. Mark Martin’s third place finish was his best since Texas last spring. Tony Stewart’s fourth place finish was his best result since Atlanta. Martin Truex, Jr. (fifth) scored his first top 5 run of 2008. Ryan Newman (sixth) now has top 10 finishes in the three of the last four races, though admittedly, he was only a threat to win at Talladega. He’s also the lone man in a 12-car Dodge fleet to have more than a single top 5 in 2008 (two). Kevin Harvick’s top 10 finish (eighth) was his first in five races. Jeff Gordon (ninth) managed his first top 10 in four races. After a hot start to the season, Kasey Kahne scored his first top 10 finish since Bristol (10th). Jeff Burton (11th) hasn’t finished worse than thirteenth in this season’s ten Cup races. Dale Earnhardt Jr.’s 15th place finish was his worst since Fontana. He’s led laps in all but two of this season’s ten Cup races to date. Kurt Busch hasn’t finished better than 23rd in his last five starts. Matt Kenseth hasn’t finished better than 38th in the last three Cup events. The top 10 finishers at Richmond drove five Chevys, two Dodges, two Chevys, and a lone Ford (Carl Edwards in seventh). Regan Smith in 21st was the top finishing rookie. Kyle Busch takes over the spot atop the championship leaderboard (not to mention numerous hit lists). He is now 18 points ahead of former leader Jeff Burton, who fell to second in the standings. Dale Earnhardt, Jr. remains third, 104 markers behind Busch. A Richmond win leapfrogged Clint Bowyer forward three spots to fourth, one spot ahead of his teammate Kevin Harvick in fifth. Tony Stewart hopped up a spot to eighth, while Kasey Kahne reenters the top 12, up one spot from 13th place. Along with that flat right front tire, Denny Hamlin deflated two spots in the standings to sixth, while Jimmie Johnson crunched his way down from fifth to seventh. Greg Biffle fell a spot to ninth; but the big loser in the points at Richmond was Juan Pablo Montoya, who fell four spots to 16th after wrecking on his own coming out of turn two at Richmond (he finished 32nd). Jeff Gordon fans, don’t despair; he’s now just two spots out of the top 12, despite a lackluster start to the season by his own lofty standards. The top 10 in points now consist of three Joe Gibbs Racing drivers, three Richard Childress drivers, and two drivers apiece from Hendrick Motorsports and Roush Fenway Racing. Behind the Chasers, drivers making significant forward progress in the points at Richmond include Bobby Labonte (up four spots to 18th), Travis Kvapil (up four spots to 19th), Martin Truex, Jr. (arresting his tumble and moving up two spots to 15th), and Elliott Sadler (up two spots to 24th). Cue up the Tom Petty CD, because some drivers are Freefalling: Kurt Busch tumbled five spots to 25th in the standings, and Matt Kenseth fell three more spots to 22nd. Overall Rating (On a scale of one to six beer cans, with one being a stinker and a six pack an instant classic): Even the worst race at Richmond in recent memory beats the best race at some tracks. I’ll give this one the last five remaining beer cans not tossed over the catchfence at Richmond. They’ll be talking about this one for awhile. Next Up: It’s off to the circuit’s best remaining race track, Darlington, for the most awkwardly scheduled race date, the eve of Mother’s Day. With new asphalt and speeds topping 200 miles an hour — at a track bulldozed into the Sand Hills back when new Packards and Hudsons still roamed the earth — it ought to be wild.